At Gliffen Designs, we pride ourselves on making sure we meet all of your needs. By offering search and display marketing development and management, we can help you target the clientele that would be most interested in your product and services. Understanding the ins and outs of Google Adwords, for example, takes skill, practice, and knowledge, and our team in marketing have just the credentials and skills to meet those needs. Having your businesses website appear when a user is searching something relevant to your product or service is crucial to starting relationships. If a user is unable to find your business they are unable to learn more about what you have to offer, what separates you from competitors, how to reach you, where your business is located and more. Our main focus for search marketing is on Google Adwords as Google is the world’s leader in search engine market share, with over 72.87% of the market. We feel that focusing efforts on Adwords is the way to go when it comes to search marketing. Adwords’ targeting methods and advertiser platform are capable of showing ads to only web users relevant to your brand or business as well as providing performance data that lets you know whether or not your advertising dollars are being well spent. Our staff has the expertise to analyze data that comes through as a result of ad clicks and impressions, as well as in Google analytics data to move forward with optimizations to client campaigns. 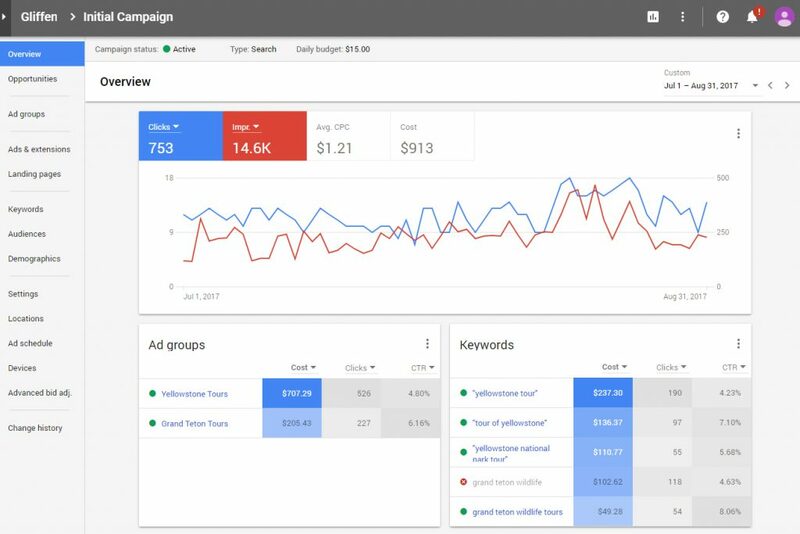 Campaigns are monitored on a weekly basis, to strive for exceptional ROI for each Adwords account. As well as a number of other factors that will ensure success. Beyond Search marketing our staff has extensive experience in handling display and video web advertising as well, through both Adwords and Facebook. We take the time to look at your businesses ideal customers and target our ads appropriately from there using Google and Facebook’s interest and topic tools, as well as choosing specific ideal placements. We keep a close eye on these campaigns to be sure to remove or exclude any placements that are not performing well for the campaign. With both search and display marketing management, we like to keep the customer informed of its performance and will send marketing reports with campaign details once a month.